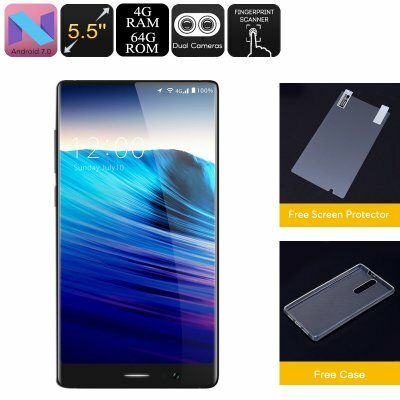 Successfully Added UMIDIGI Crystal Android Phone - Android 7.0, Octa-Core, 4GB RAM, 5.5-Inch FHD, Metal Body, 4G, Dual-IMEI to your Shopping Cart. Dual-IMEI numbers and 4G bring along ultimate connectivity. From now on, you’ll always be reachable on two phone numbers at the same time. Additionally, you can browse the web anywhere you’re at. Whether you’re at home, work, or outside – you can always enjoy the fastest mobile data speeds available. The phone itself runs on an Android 7.0 operating system. This means that you’ll be treated to a smooth user experience while enjoying the latest software features available. The UMIDIGI Crystal Android Phone packs a powerful Octa-core processor and a whopping 4GB RAM. Together, this hardware puts forth an outstanding performance. Your Android phone is capable of tackling games, movies, and the latest Apps. All of which can be easily downloaded via the Play Store. A stunning 64GB internal memory and 256GB external storage support deliver you with plenty of space to keep all your favorite files and media. All your files can be accessed easily with the touch of a finger thanks to the phone’s ultra-fast fingerprint scanner. A large 3000mAh battery brings along an unbelievable continuous usage time of 20 hours. Your phone furthermore supports a 12 day standby time. Thanks to this cell, you’ll be able to head out without ever needing to worry again about running out of juice. Your Android phone will get you through multiple days of regular smartphone usage. If you’re looking for a great Android phone that has it all, the UMIDIGI Crystal certainly is a device to consider. The UMIDIGI Crystal Android Phone comes with a 12 months warranty, brought to you by the leader in electronic devices as well as wholesale smartphones..